Every once in awhile you run into an issue where a program just doesn’t want to uninstall. Ran into this scenario with MSSQL Server 2008 R2. Following the normal Programs and Features uninstall in Control Panel I received the message of failed to uninstall. This process requires removing directories, services and registry entries. As with anytime the registry is involved you will want to back up the registry. First remove any SQL services using sc delete <service> command. To get the name of the service double click on it in services.msc and find the name used for ServiceName or use sc command from the command prompt. Now that we have the service name, let’s stop them and remove them from existence. Do this for all the services. Found for SQL server. It is possible there could be files and use and you will need to reboot and then retry the deletion after the reboot. **Note: Backup the registry before deleting any entries. You can render the server unusable with an incorrect deletion. 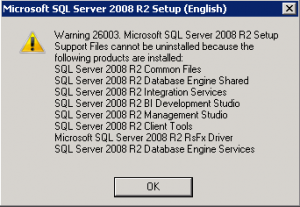 At this point you should be able to reinstall MSSQL Server 2008 R2 on your server. I did all of the following you have stated, but still having the same problem.